Dr. Scott Miller joins Dr. Feinberg in studio to discuss prostate cancer awareness and the upcoming Blue Ties fundraiser. Throughout his career, Scott D. Miller, MD has been led by one consistent philosophy: focus solely on patients’ special needs and perfect the techniques necessary to deliver the best possible care. In adhering to this creed, he’s been nationally recognized by numerous colleagues, media outlets and patients for his achievements and excellence in care and surgical innovation. As a result of his continued diligence, Dr. Miller now serves as Georgia Urology’s director of Laparoscopic and Robotic surgery, minimally invasive surgical procedures that allow for less pain, minimal post-surgery complications, and quicker patient recovery. Dr. Miller’s work in urologic laparoscopy began when laparoscopy was still a developing practice in the United States. After graduating from the Medical College of Georgia, he completed his urologic residency at the University of Kentucky Medical Center; one of the first residency programs to adopt and embrace advanced urologic laparoscopy techniques. This extensive training endowed him with the expert knowledge necessary to begin his career of firsts right here in Atlanta. In 1995 he became the first physician to bring the art of urologic laparoscopic surgery to Georgia by performing the state’s first laparoscopic nephrectomy (kidney removal surgery) for cancer. In addition to a number of other surgical firsts, including the state’s first robotic prostate removal, Dr. Miller continues to actively develop new surgical techniques and share them with surgeons worldwide. Annually, he performs approximately 300 laparoscopic and robotic procedures. A great deal of his work is also devoted to the treatment of prostate cancer patients and raising prostate cancer awareness. 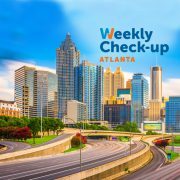 He is the founder and president of ProstAware, an organization dedicated to educating the Atlanta community about prostate health and how everyone can get involved in the battle against prostate cancer. Dr. Miller is also a regular guest host on The Weekly Check-Up radio show, where he brings together guests from various healthcare fields to provide tips that help listeners lead better, healthier lives. When not at the office, he is an avid songwriter and guitarist who loves spending time with his wife, Mindi; his daughter, Allison; and his son, Eric.